We are pleased to announce an enhanced experience for those conference attendees who are interested in participating in swim clinics. Please sign up for these clinics when your register for the conference. Sherry brings a wealth of experience to our swim clinics. 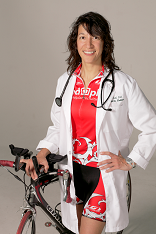 She is a retired Hand and Microsurgeon; USA Triathlon certified Level 2 Coach; USA Cycling certified Level 3 Coach; USA Swimming certified Coach; and has 24 years of experience in the sport of triathlon and has completed in over 100 multi-sport events. Dr. Lal practices Sports Medicine in Birmingham, AL. She is a spokesperson for Exercise Is Medicine, an international initiative through the American College of Sports Medicine, advocating exercise to help promote health and wellness. She is also the Medical Director of A Center for Eating Disorders and an adjunct instructor in Physical Medicine and Rehabilitation at the Univ. of Al., Birmingham. The clinic is designed to provide hands-on assistance in finding the perfect swim stroke. Beginning with finding balance and progressing through the mechanics of learning an economical and powerful stroke, participants will come away with tips to progress their swimming. No open ocean water swimming! An orientation will take place for all swim clinic participants on Sunday October 7 at 12:45 p.m. in the Alii Surf Conference room. After the orientation, those that have signed up for Sunday’s Swim Clinic I will walk over to the lagoon for Swim Clinic I. All swim clinics are held at the Royal Kona Resort’s Lagoon (next to lagoon tower). This is shallow water and protected from the surf. No open ocean water swimming! Each swim clinic is limited to 20 persons and participants may only sign up for one clinic. Participants must be a full conference registrant to be eligible for the swim clinic. We regret that spouses/friends/guests are not eligible to register for these clinics in advance. If clinics are not sold out, you may register a guest on site. The fee is $10.00 per clinic. Limit one swim clinic per person. All clinic times are subject to change as the 2019 conference agenda is still under development.